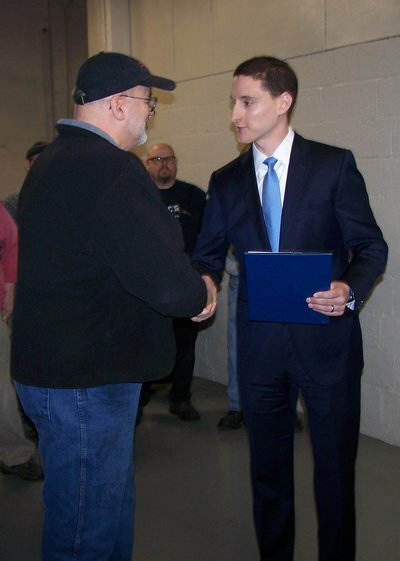 Ohio Treasurer Josh Mandel presented the inaugural Ohio Strong award to John Incorvaia Jr. of Toledo Metal Spinning (TMS) on March 24. Mandel launched the new effort to help recognize men and women in manufacturing and the skilled trades and to raise public awareness to encourage more people to pursue careers in those fields. Incorvaia, a native of Toledo and graduate of Central Catholic High School, said he was honored to be chosen as the first person to receive the Ohio Strong award. He began working in metal spinning in 1973 and has worked at TMS since 1983. Incorvaia said he is currently making large stainless steel hemispheres used in the production of chocolate and other food products. If the Incorvaia name sounds familiar, it may be because John’s family owns and operates Inky’s Italian Foods, a well-known Toledo restaurant. 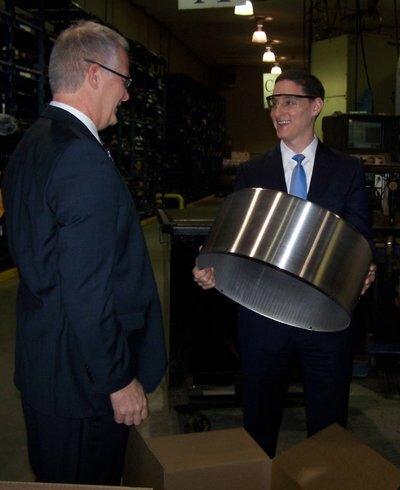 As part of the Ohio Strong effort, Mandel has been meeting with small businesses, family-owned manufacturing companies, vocational trainers, job creators and workers throughout Ohio. “I launched Ohio Strong to recognize dedicated men and women like John from across our state who work in these fields that are so vital to our economy,” Mandel told the group of employees and local media before presenting the award to Incorvaia. Eric Fankhauser, vice president of TMS, said the Ohio Treasurer’s Office called the company about presenting the first Ohio Strong award to one of their employees and they recommended Incorvaia. “As baby boomers are retiring, I frequently hear about the shortage of welders, pipe fitters, electricians, carpenters, machinists and other skilled trades across Ohio,” Mandel said. Approximately, 600,000 manufacturing jobs remain unfilled nationally because employers cannot find qualified workers, according to a 2011 skills gap survey by the National Manufacturing Institute. A recent Bureau of Labor Statistics study showed 48 percent of college graduates are working in jobs that don’t require a four-year degree, Mandel said. “I believe there is a quiet crisis upon us, and in order to prosper as a country, we need to inspire more young Americans to pursue careers in the skilled trades,” he said. After presenting the award, Mandel toured the Clinton Street facility with Incorvaia, Fankhauser and members of the media. Incorvaia and other workers demonstrated their skills during the tour. TMS was started in Toledo in 1929. Brothers Bill and Ken Fankhauser bought the business 50 years ago. Eric and his brother Craig, sons of Ken, now run the family business that employs 40 workers. The company has become a leader in metal spinning applications for a variety of industries, including aerospace, automotive, building materials, home brewing, military, plastics, pharmaceuticals and others. Fankhauser said the company processes 200-300 jobs in the plant at any one time in lots of up to 10,000 pieces. About 80 percent of their orders are repeat business, he said. Fankhauser said the company hasn’t gotten this kind of attention since a fire at the plant in 1998. For more information about nominating someone for the Ohio Strong award, email ohiostrong@tos.ohio.gov. Previous PostOperators Revel in Hydraulic-Press Controls RefreshNext PostTMS is live with new website!